It was a line worthy of Clint Straker and Ian knew it. He couldn’t stop being a writer, always thinking of the next line in one of his thrillers. But he was living a thriller now and it was no thrill at all. This is one of those books that’s super easy to write about — if you like the premise of the book, you’ll like the book. It’s just that simple. The tricky part is finding someone who wouldn’t like this premise. Ian Ludlow, television writer turned thriller novelist, can’t believe his eyes — a terrorist attack in Hawaii went exactly the way that he designed and he’s pretty sure that someone is trying to kill him. Ludlow was part of a group of writers (movie, TV, novelists) that came up with some scenarios for the CIA that terrorists might use, so the CIA could design counter-measures. This is a thing that actually happened (maybe still does) following 9/11, because writers have much better imaginations than government employees do. One of those scenarios is playing out in real life and Ludlow doesn’t know what to do. Clearly someone out there doesn’t want Ludlow spreading the word that he’s the source for this attack. Before he realizes what’s happening, Ludlow is running for his life and has dragged Margo along with him. Margo’s a dog-sitter, house-sitter, aspiring musician, and occasionally drives authors visiting Seattle to their signings. That’s how this poor girl gets sucked into Ludlow’s mess — she saves his life (and then he returns the favor), dooming her to having to run with him. Add in some over-the-top villains (I hope, see below), and Goldberg’s signature wit and solid writing, and you’ve got yourself a winner. 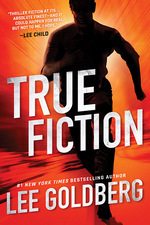 This is a fast fun ride featuring about the most unlikely of all thriller protagonists. Ian Ludlow isn’t really in any kind of shape; he has no skills with hand-to-hand combat, cars, or weapons — his people skills are suspect, really; all he has going for him is a pretty agile mind. Margo’s a little better off, but not much. They quickly run to the home of one of Ian’s friends who lives off of the grid and is paranoid enough he’ll believe their story. Which may not really be the strongest of qualifications, but they can’t afford to be choosy. The three of them will have to figure out a way to survive — and possibly stop whoever it was behind the attack. Does anyone else remember Condorman? The Disney film about a comic book writer/artist who accidentally (very accidentally) becomes a super-spy? I was 7 or 8 when it came out and loved it. Anyway, I had a flash-back to that when Ludlow stumbles his way into taking out one of the many assassins that come after him — one of the many times I had an honest audible response to this book (not a book I recommend reading in an ICU ward, for what it’s worth, people tend not to like noises there). Now, I called the villains over-the-top. I’m not really sure they are — they seem over the top, but there’s a little part of me wonders how hard it really would be for someone to pull off something like this. John Rogers, of Leverage, frequently talked about how some of their over-the-top bad guys were watered down versions of the real thing (because no one would believe the real thing). Take my word for it, I don’t have time to track him down saying it. Let’s put it this way — they’re perfect for this book, and like just about every thriller villain ever, it’s best that they stay inside the book. While he’s telling a very fun story, Goldberg takes a little bit of time to satirize thrillers, thriller writings, and thriller heroes — I loved every bit of that. It helps that Goldberg writes and reads the same books he’s satirizing, so you know he does it with love and honesty. Some of the excerpts from Ludlow’s books are just awful, it must’ve been hard to write (but so much fun). Ditto for the TV shows that Ian’s friend Ronnie starred in, I really hope that those are things that Goldberg made up for this book (and fear they aren’t). This feels like Goldberg and Evanovich’s Fox & O’Hare books, or maybe The Man with the Iron-On Badge (which features a protagonist only slightly more likely than Ian) — not his more serious work like King City. The story moves quickly, deftly and will leave you smiling — I can’t imagine Goldberg writing a disappointing book at this point, I just don’t think he can. Pick this up, you will be entertained. Why this took me so long to post, I’ll never know…it’s bad enough that it took me a month and a half to read it. 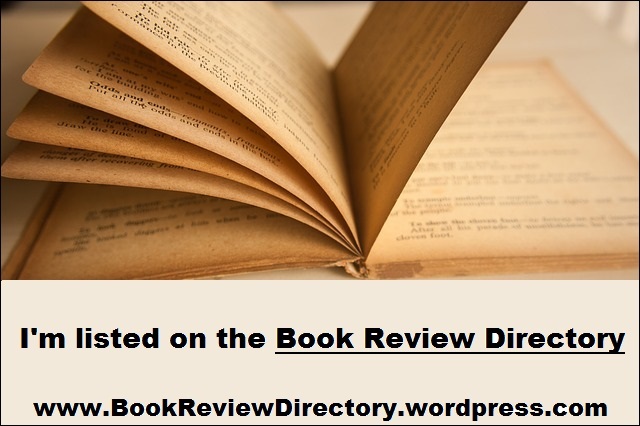 Following the cliff-hanger ending to The Scam, I wondered if this book would shake off the fairly well-established outline for these books and instead, we’d get Kate globe-trotting from exotic locale to exotic locale hunting them down. 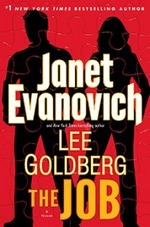 Thankfully, Evanovich and Goldberg had something better in mind (not that something like my idea wouldn’t have been fun), while pretty much sticking to the typical outline. Nick’s kidnapping ends up setting the stage for taking down an international thief and would-be terrorist. This thief, Dragan, is the anti-Nick. He’s about profit, violence, and more profit. There’s no style, no fun, no zest . . . But Dragan knows what he needs to accomplish a couple of his biggest heists: Nick. Naturally, he gets more than he bargains for (and I don’t just mean Kate). Of the various criminals, masterminds, thieves and all around nasty folks that these two have taken down or encountered, Dragan is the worst. 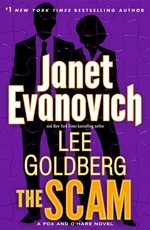 Thankfully, Evanovich and Goldberg are able to balance the threat and the humor, the romance and the robbery. It all comes down to relationships: which is really why we come back to this series. Kate and Nick (I’m gladdened/relieved/a little surprised by where they have the relationship now). Nick and Jake. Kate and Jake. The rest of the team with Nick and/or Kate. Jake and anyone he comes into contact with (if we could get some young, active duty Jake stories, that’d be awesome). I like the way that their team is doing non-con work together — despite their best intentions, Nick and Kate have formed an actual team. There are a couple of additions this go-around (one is a blast from the past, but still, new to this side of the road). I think there’s a misfire here — there’s a new foil introduced into Kate’s life, an FBI agent who is to work with her without knowing about this little side-project. He’s a little humorous, but mostly annoying. And his existence seems to run counter to the people at the top of the FBI sanctioning (however unofficially) what’s going on here. I’m prepared for them to convince me otherwise, but until they do, I’m going to groan whenever he shows up. The writing is crisp as ever, it seems so smooth and effortless that it has to take a lot of work. There’s a great info-dump (because that’s actually a thing, rare as it may be) about an infectious disease. Not only does it inform the reader, but it’s written in a way to flesh out a character and add a sense of threat to the narrative. There’s an editing blunder in the final few chapters that took me out of the moment (using Kate’s name instead of one of Dragan’s crew), that was oddly reassuring to me — even the big publishers stumble, not just the small press/self-pubbed guys like I’ve been reading so much lately. I can’t recall if I’ve mentioned Harry Harrison’s Slippery Jim diGriz when talking about this series, but this is Nick Fox at his Slippery Jimmiest (Kate is a little like Angelina diGriz, too, come to think of it — but not as much). Fans of either should look into the other. The Pursuit is another solidly entertaining adventure in this series. Really looking forward to what’s next. Oh, I should add that if you’re a fan of eggs, you might want to eat a few extra before reading this book, because it’ll be tough to eat one for a while. Trust me on this one. “You can never have too many weapons,” Jake said. “What kind of roadside emergency would require a rocket launcher?” she asked. I was prepared — even half-way expected — for this to underwhelm me. There wasn’t anything driving me to that expectation, maybe it was just my mood. Thankfully, this surpassed my expectations/fears — not for one second. This was another breezy, fun, adventure for Nick, Kate and the crew. From page 1, The Scam was firing on all cylinders. The main mission was a lot of fun, with a believable target, just dangerous enough. The side missions were interesting and did a good job pushing the plot forward, not just being B stories. There was even some tie-ins to previous cases — up to and including a recurring character that’s not part of the team. Boyd is pretty much the most annoying character in the series, but this time, they struck the right one with him. He was insufferable as always, but he didn’t get on my nerves at all. Which means the book probably deserves a bonus 1/2 star rating just for that. The rest of the team was used only minimally — just little tastes of them all. I don’t think I’d want that all the time, but it worked here. Kate and Nick were…well, Kate and Nick. I think Kate was a bit more honest with herself about her motivations — both professional and personal — than we’re used to seeing her. Maybe the same could be said for Nick, too. The ending (always the trickiest part of a con story) worked — Kate’s improvised weaponry was just great. Even if we didn’t get to see either the roadside emergency rocket launcher or pocket paper clip (which doesn’t mean it wasn’t a great line), sorry Chekhov. There were a couple of things in the closing pages that floored me. 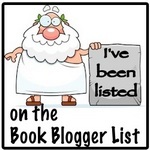 I didn’t think Evanovich would do either of them, just doesn’t seem her style. I like the fact that she can surprise me (maybe it’s Goldberg’s influence — maybe not, but I like the guy, let’s give him the credit). Anyway, there were things in these pages I never expected that I’d get out of Fox and O’Hare. Bravo. Book five needs to arrive soon. I realize my saying so isn’t going to make it happen. But just in case I’m wrong about that, I should get it on the record. Read: November 29 – December 1, 2014 How is this only the third in the series? 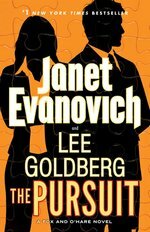 It’s a testament to the professionalism and craft of Evanovich and Goldberg that this feels like a series that’s been around for at least a half-dozen books, a well-oiled machine. The hook to this particular case — someone posing as Nick Fox pulling off some major heists — was pretty fun, and a great excuse for Kate to go jet-setting around the world. That lasted just long enough to set up the major target for this novel: one of the biggest, baddest, most mysterious Drug Lords in the world. Thankfully, he has a pretty major Achilles’ heel that Nick and Kate were able to take advantage of. In just about any other series, I’d cry “foul” about someone like Lester Menendez falling for this implausible con. But it totally worked in this world — and would probably have worked if Nate Ford and the crew had tried it, too. Slick talking, fast work and a hint of danger (more from the psychotic bodyguard Reyna Socorro and her trusty AK-47 than from her boss) — and bam. The bad guy gets defrauded and sent away for a long time. The major difference between this one and the previous two installments is that the rest of the team doesn’t have as major a role to play — don’t get me wrong, the usual players and some new faces are there and important. We just don’t spend as much time with them — it’s more heavily geared to being the Nick and Kate Show. They’re even restrained in their use of Jake O’Hare. I don’t have anything against the rest of the team, and really enjoy some of them — but I’m glad that they were put in a secondary position this time. As long as they get featured more prominently on a regular basis, I think focusing on the title pair makes sense. The only suspense really is how far the “Will They/Won’t They” go (and so far, that hasn’t reached the point of being annoying). We all know that Fox and O’Hare will get their target, we may not be sure how — we won’t know how much fun there’ll be along the way, how much private property will be destroyed, and how many exotic (or domestic) locales will be visited along the way. And it’s fine that this isn’t a suspense-filled series. It’s a lot of fun. That’s what it promises, and that’s what it delivers — as long as we don’t look for more than banter, impossible cons and slick writing, we won’t be disappointed. Not that the first two were slogs by any stretch of the imagination, but I raced through this — with a little more sleep, I’d have tackled this in one sitting, but I had to leave the last 50 pages for another day. The writing, the plot, the banter was just so smooth it was almost impossible to stop once I got started. I thoroughly enjoyed this one and already am looking forward to the next. Nicolas Fox and Agent Kate O’Hare are back in action — better yet, Janet Evanovich and Lee Goldberg are back and better than ever. This time their target is none other than the head of a multinational security force/private army owned by the former White House Chief of Staff. Easy pickings, right? This is just the ticket for readers who miss The A-Team or Leverage — clever schemes improbably pulled off by team of pros to take down a real scoundrel. This team gets around a bit more than the others do (better budgets in books than TV shows) — they globe hop from D.C. to Shanghai, to Montreal and more — even the Scottish hinterlands. The shenanigans in Montreal, in particular, were hilarious and ever so smooth. I enjoyed The Heist (my review) — a lot, actually — but this was better. Everything — the interplay between the characters, the plot, the crazy schemes that Fox & O’Hare cooked up (individually and together), the new guys, the villains — all of it worked better this time out. If these two are this polished on book two, I can’t wait to see what Evanovich and Goldberg are like by the time they get to five or so. One part Jack Reacher, one part Jesse Stone, this first installment in Lee Goldberg’s new series reads like a Western set in the 21st century. 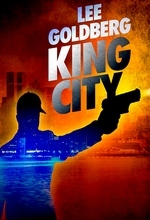 Tom Wade, a rigorously scrupulous cop is assigned to a part of King City so crime and poverty-ridden that city officials pretend it doesn’t exist. He’s sent there because the police force is overly-politicized where it isn’t overtly corrupted, and they can’t fire such an upstanding cop–but maybe his new post will lead to him being killed. Wade is fully aware of this, but accepts his new post with gusto–he has a chance to make a difference and sets out to do so in as splashy a way as possible. This isn’t a subtle book with complex characters–and doesn’t try to be. The characters are pretty much the dictionary definition of “stock,” the good guys are good, the bad guys are really bad–and that’s that. A fun, straightforward testosterone-y action book. Hopefully the first of many. Despite being a big fan of Lee Goldberg and Janet Evanovich, the prequel to this (Pros and Cons) left me apprehensive about The Heist. But I’m, so, so glad that I went ahead and picked this up. Kate O’Hare’s a top-notch, driven FBI agent, cream of the crop type, who’s obsessed with bringing down Nick Fox, an equally driven and top-notch con man. After years of trying, she finally gets the cuffs on him, only to find herself thrown into an unwilling alliance with her target in an off-book mission to bring down some of the FBI’s most-wanted and most-difficult to catch. And then the globe-trotting hijinks ensue. There are a few moments that are pretty heavy-handed, and early-on the humor is a little broader than it needed to be. But on the whole, this is a fun read. I was initially tempted to go over some of the laugh and/or smile generating lines and try to guess which author came up with them, but soon gave that up and just enjoyed them (I’m still pretty sure I could get 70% or better on a test of them). The temptation would be to focus on Fox, O’Hare and their target. 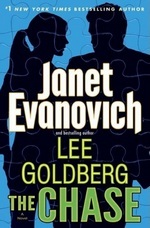 But Evanovich & Goldberg are sure to give the reader a decent amount of supporting characters — providing other people for the protagonists to react to, other perspectives for us to see the protagonists through, as well as people whose possession of skills Fox/O’Hare don’t have keep them from being total super-hero types. They need a team of experts to get them through this mission, and thankfully, the experts here are pretty amusing. I’m not sure I need to see most of them again — I’m not opposed to it, but it would be interesting to have an ever-changing team working with them. Other than O’Hare’s father, anyway — it’s clear he’s sticking around, as he should. Fun story, fun characters, with good action (and yet no one has a car get blown up!! ), and some laughs. Promising start to a new series, I’m coming back for more! * Only thought of the Remington Steele comparison when I was about halfway through this, and now I’m pretty sure I’m going to be seeing Stephanie Zimbalist and Pierce Brosnan in my mind next time I read one of these.